Can you see the turkey??? Yesterday afternoon I felt that I must get out of the house and outdoors. I “made” David, Caleb, Seth, and Sarah come with me. David was the most unwilling, for some reason walks make him impatient, perhaps because we don’t just walk, we stop constantly to look at things. “Walk” is probably not the best word to describe our walks. At the top of the dam trail I found a turkey feather. When we got up to the field the turkeys were there. In great excitement, the boys and I tried herding them toward us but as I ran Sarah began to sob “I can’t run fast! I can’t run fast!” so I stopped and went back to her, she was losing her breath in her sadness and crying so I sat down and held her, comforting her by saying I would never leave her alone. How terrifying to watch your mother run fast AWAY FROM YOU! “What IS a turkey?” she asked. Oh, dear Sarah. She hadn’t even seen them in the distance, she didn’t know what a turkey was, perhaps it was monster-like! No wonder she was so very upset. We sat and had a conversation about turkeys and the boys came back to join us. At this point our “walk” had lasted all of 1o minutes and David said he was going home. “NO YOU’RE NOT” I cried. There were complaints from the children. “Wait a minute! You can sit in front of the tv, you can play video games, but you can’t sit in the grass?” “It’s too itchy! !” “JUST sit down, boys!” The whole walk-idea wasn’t working. But, as we sat I started talking to them about the praying mantis we found the last time we were up there…..”maybe we can find another one and take it home to put it in a jar”, I offered. David actually thought that this was as good idea. 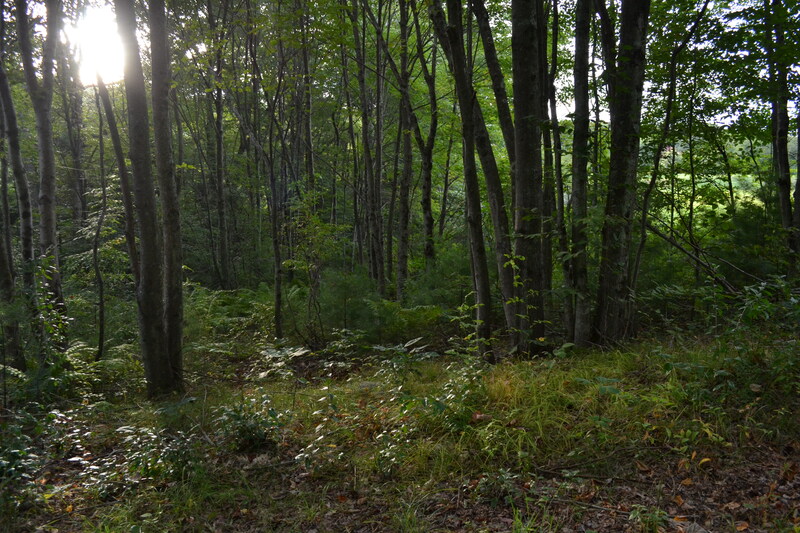 We all got up and started to peer into the bushes at the edge of the forest. We found nothing but bumble bees on the beautiful dark yellow goldenrod flowers. The boys kept going, though, and everyone started getting along again. We played by the stream for quite a while. David studied milkweed. We are both sad because we didn’t see any monarch caterpillars this year. What’s happening to them?? We popped popper plants and sat up on the cement drain thing, which is sort of like a platform. 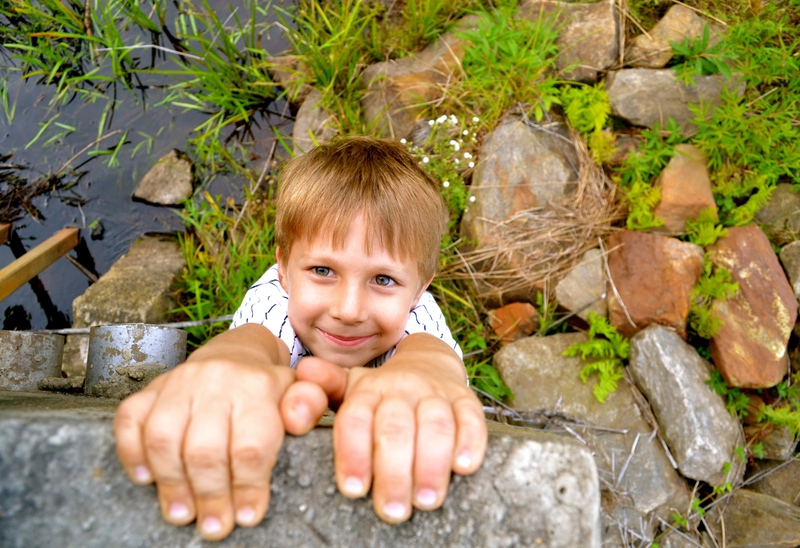 The kids have to climb up to sit on it, the water drains through a pipe and we can look down into it. 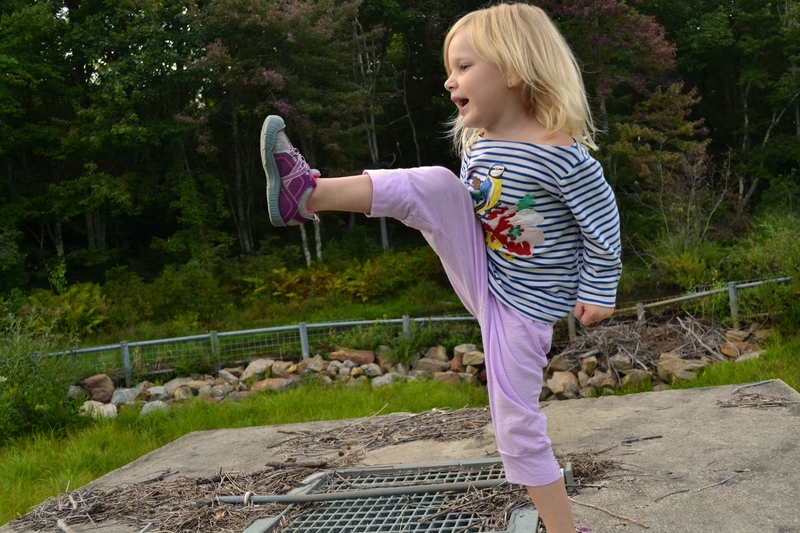 Sarah felt as if she was on a stage so she did her fighting moves. Seth was exploring but kept coming back to mama for a quick “hello”. 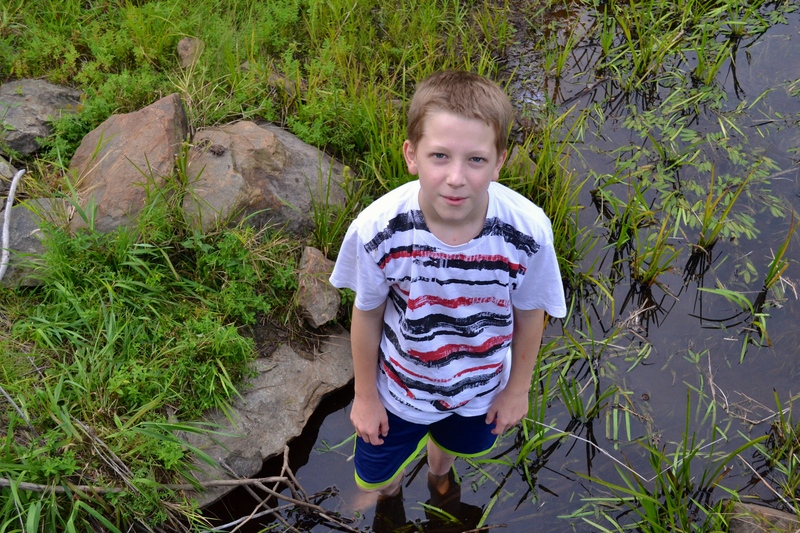 Caleb was collecting beaver-chewed sticks and David tried catching a small crayfish without success. You can be sure there would be a picture of it if he got one! 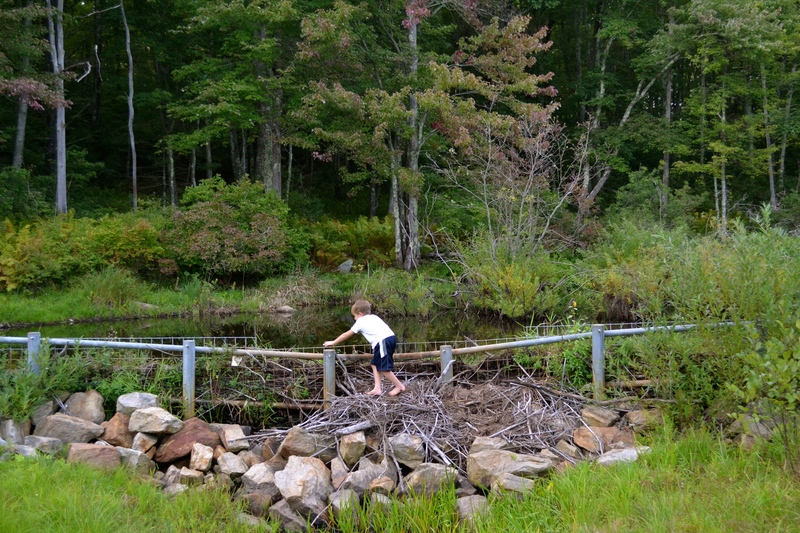 Doesn’t the pile of sticks look like the work of beavers? I was watching Seth and had a little panic when I saw him shaking an arm to get something off himself. I immediately thought he had walked over an ant hill, but it was only a slug. “I hate slugs” he explained. 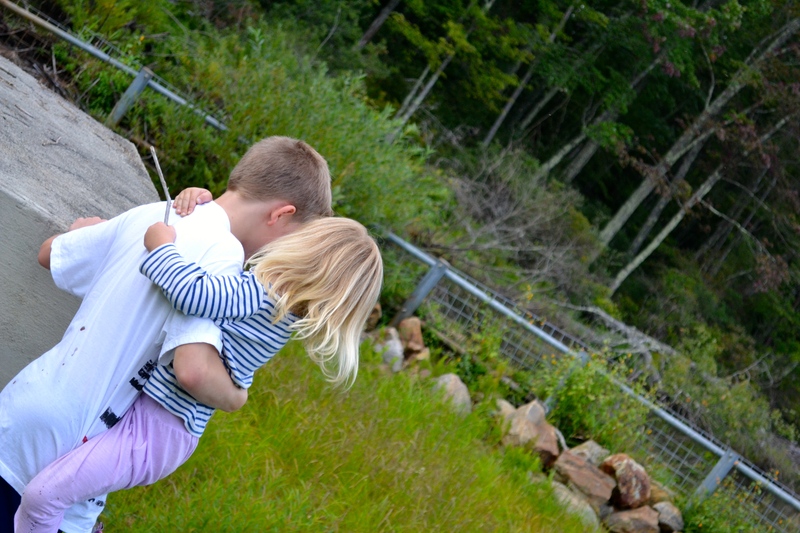 David begrudgingly helped his little sister down, but I could tell that he felt good about it after it was over. The lighting at the end of the day is so pretty….Caleb had generously given each child a beaver-chewed stick to swing around on the way home. The lighting at the end of the day is so pretty. 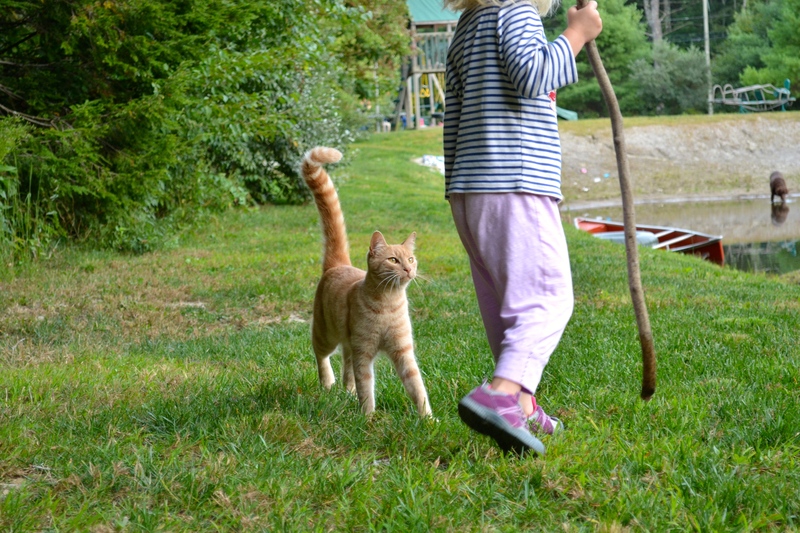 Billy Cat was ready to greet us as we returned, he was very interested in Sarah’s stick. When we got in the house it was time to go get the other children from school. I hadn’t given anyone dinner at this point so I loaded everyone up and we picked up J, E, G, and Emily. We took Emily home and drove to the grocery store, & everyone was loud. Grace was telling me about a hard part in her day, the little ones were bickering in the back seat (I don’t know what’s going on with them lately, I’m going to blame it on Rich being gone all week), and so on. I needed some quiet so I didn’t let anyone come in the store with me to get stuff for a taco dinner. By the time we arrived home it was 7:00pm and I was feeling a lot of rush and pressure about getting dinner done so the younger ones could get to bed. They are so tired by the end of the day. In the midst of doing 8 things at once as I prepared dinner, GRACE CAME IN THE HOUSE to tell me I had to come to the chicken coop!! “I can’t, I’m cooking meat!! !” “DAVID CAN WATCH IT, YOU HAVE TO COME, MOM! !” She would give me NO HINTS except the reassurance that the hens were alive and well. Would you take a look at this? 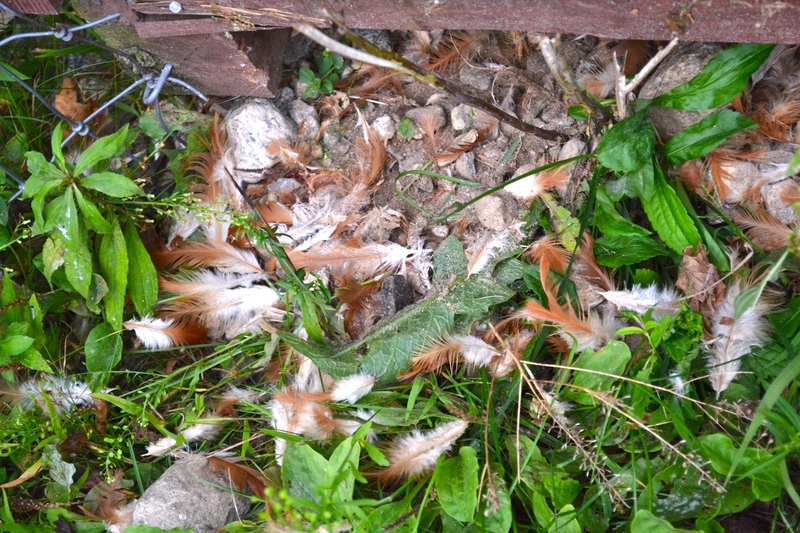 On the upper left you see a bunch of feathers from one of my hens. 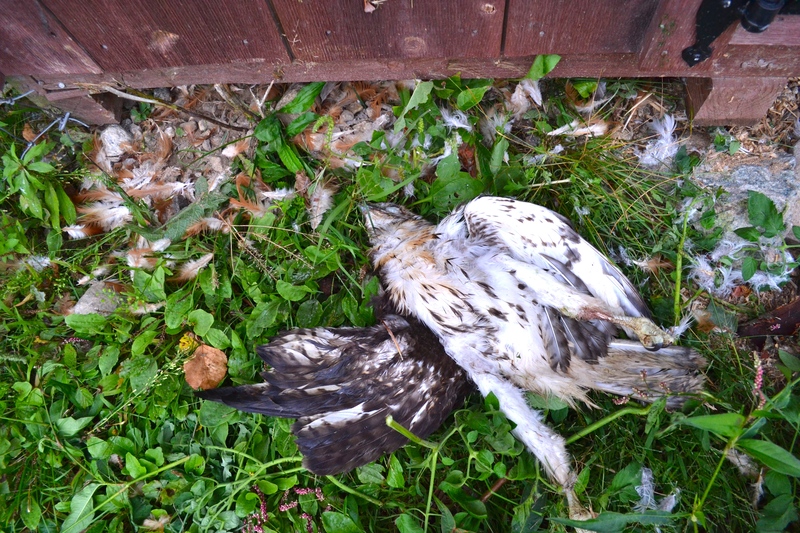 The dead bird is a Hawk, which most certainly was in the process of KILLING THE HEN when ……….. SOMETHING KILLED IT. I am intrigued because it is a mystery how it could have died. Our dog didn’t kill it, I know, because the chicken coop is behind his electric dog fence. Was it a cat? Was it the rest of the flock (four hens?) defending their sister-hen? Oh how I would love to know the answer to this story! 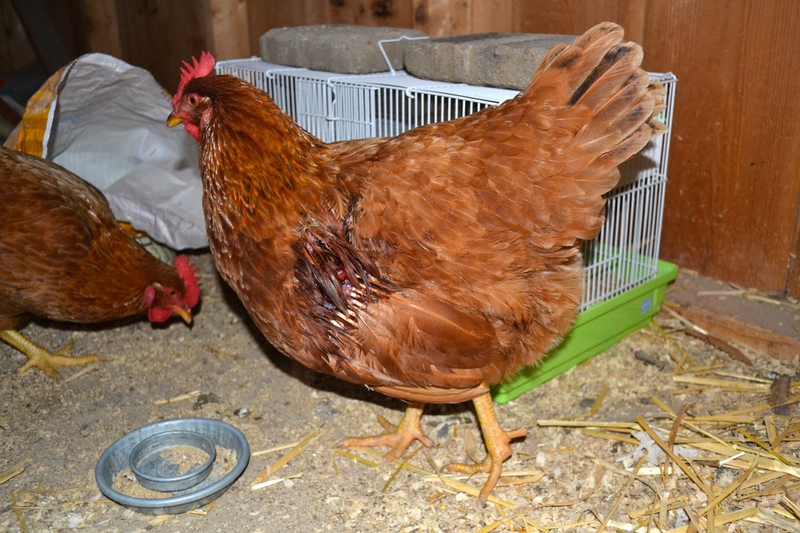 As for the hen which lost so many feathers……..
She is wounded, but happily eating and drinking in the coop like nothing at all happened to her. She’s thankful to be alive. 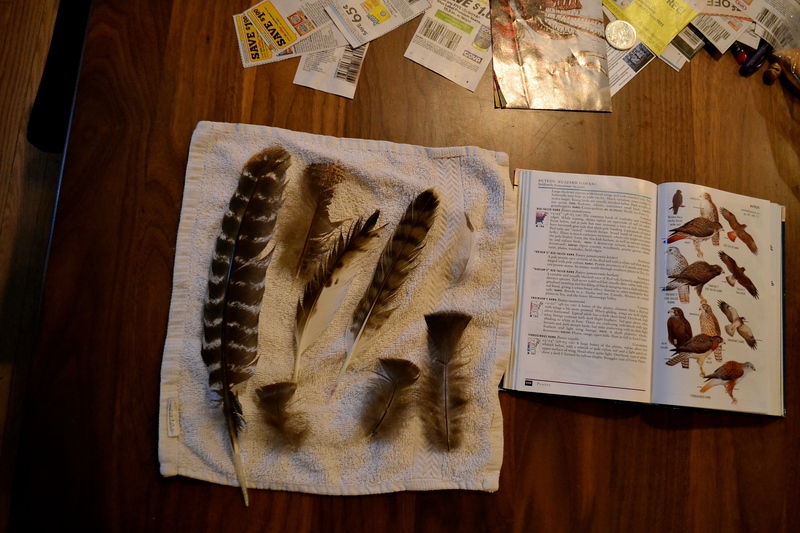 All in all, the day yielded eight new feathers for my collection. Five from turkeys and three from the hawk. I pulled the feathers from his dead body this morning and washed them. This entry was posted in it's the little things, nature and tagged chickens, large family, nature by Shanda. Bookmark the permalink. Oh, I’m so glad the story had a good ending! 🙂 Very curious, indeed! I wonder how many ‘lives’ chickens have? She surely used up one of them! I’m glad she’s okay. 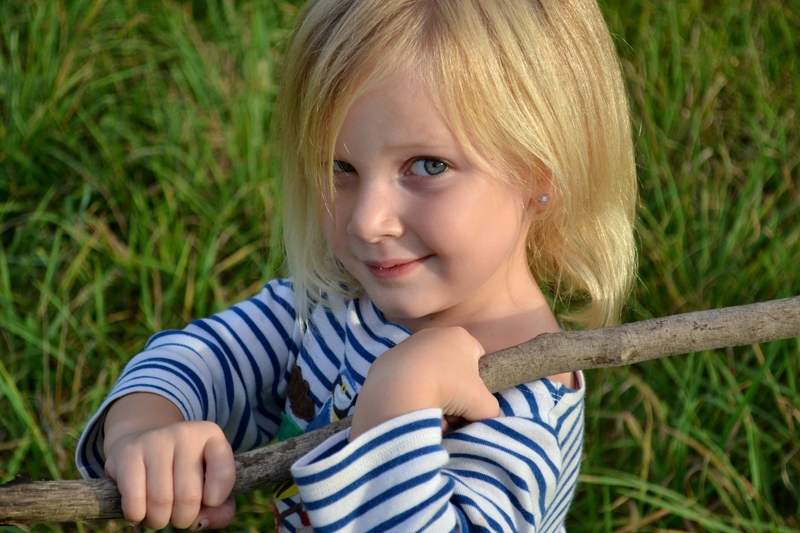 I love hearing about your nature walks. 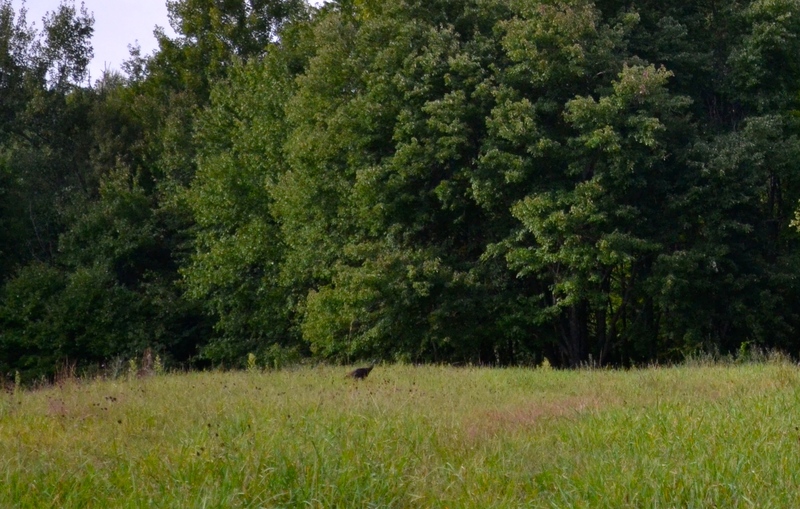 We’ve seen a lone stray turkey around here a couple of times, but only from a distance. How magnificent to see a whole flock of them! There were only about six in the flock, and boy do they get going when they sense someone looking at them! LOL My chickens usually only have one life. Happy Friday, kara! This is one hell of a story! I too had a near death experience of my five chickens! Lovely kids, lovely property, and lovely hens!! Thank you antynini! I’ll have to hop over to your blog so read about your adventures! Thanks so much for the comment, it makes blogging so much more fun. 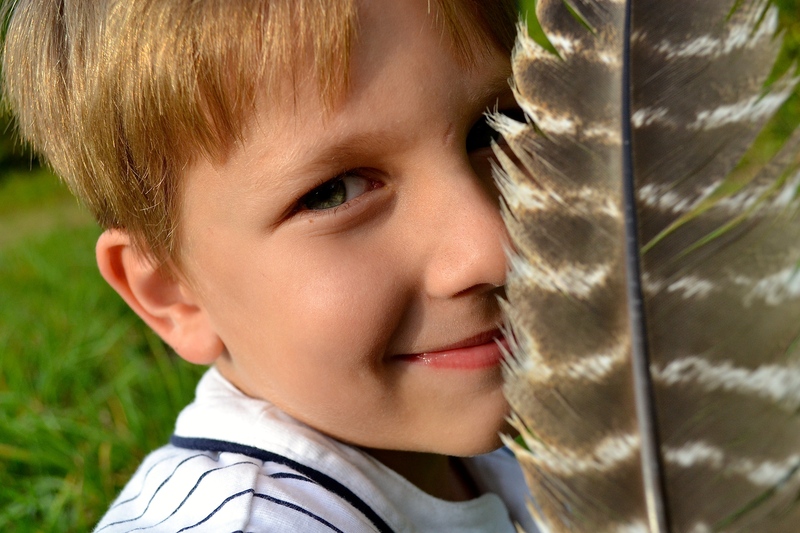 Eli, my feathers are taped into my nature journal….I’ll have to post pictures at some point. I know, Sarah was making me laugh with her moves, she even made the sounds (hi-ya!) So cute, it comes from having brothers I guess. Grace and I felt badly for the hawk, too. We clutched each other as we bent over it. My goodness! How fascinating! I’m super curious too, how it could have died. I would LOVE to see your feather collection!! How on earth do you wash feathers? Do you use soap? We have begun a collection but ran out of space in the frame and on the wall. I guess not everything is meant for display. You have great stories to share. 🙂 When I read them I think “Nature lovers unite!” ha!